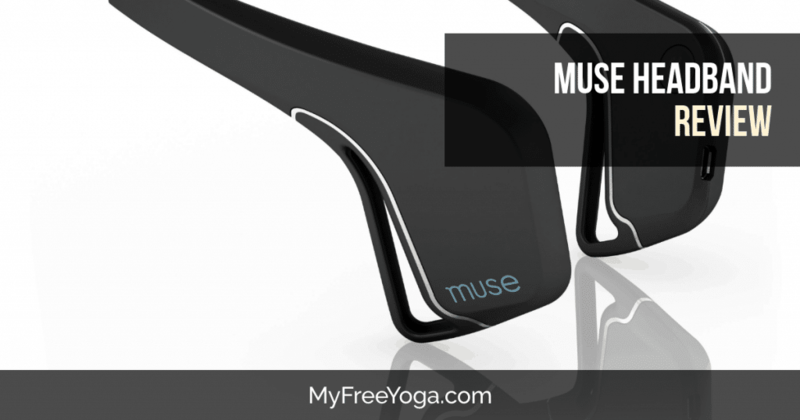 In this Muse headband review we are going go over why this is a good product for anyone wanting to meditate. Muse is probably one of the highest quality and most respected yoga accessories manufacturer and they are always set on surprising customers with their products. Among other things, Muse has developed a headband which will help in guiding you through your meditation practice using EEG scanners that read your brain waves and thus can take the EEG data and give you a read out of your brain activity. It really is a perfect tool for both beginner and experienced meditators. Muse is made by a Toronto Based company Interaxon that is focused on brain-sensing technologies. They have worked in top-tier goods, transportation and tech companies to create brain-sensing customer programs and promotions. Interaxon has done some remarkable work and is definitely worth learning more about! The headband works with sensors on your forehead and around your ears and tracks your brain activity while you meditate. Then during your meditation it plays sounds accordingly to help in guiding you through. Starting is quite simple, all you need to do is connect the calm app, take a tutorial, calibrate it, and you are off and meditating. Finally you can see your results after each session and can track your progress over time along with lowering your stress levels. As mentioned above, setup was pretty easy, you just need to charge the headset using a micro-usb cable which is provided in the box. Once done download the companion app and turn on your bluetooth. Just follow the setup steps. One thing that is a bit frustrating with it, is that you can only use earbuds with it. The over ear headphones won't work due to the device using the back of your ears to keep it pressed against your forehead. The Interaxon Muse has 7 sensors in total which are spread out accordingly. There are two located on the forehead, 2 behind the ear, and 3 reference sensors at the back of the device. The sensors measure brain signals. 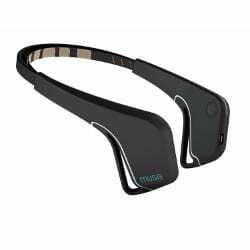 Any muse brain sensing headband review will tell you what an extraordinary product it is and how much it can help you meditate and reach a relaxed state. But before getting into other technical details, you should know what this product actually does. Basically the device will help you get into a relaxed state and have your brain become calm, as opposed to active. The product does this through music, through alpha and delta waves that are highly important in this process and gives real-time feedback so you know what your mind is doing. In other words, the headband adjusts the sounds that you hear depending on your brain activity. When you lose your calm and your mind wanders during your meditation session, the Electroencephalography eeg sensors pick up on these signals and the weather sounds change. If you are in a calm state, then you will hear peaceful sounds like tweeting birds, and if your mind is wandering due to stress or you are just having thoughts, you will hear rain or thunderstorms in your ears, depending on how active your mind is. The advantages of this product are pretty much obvious. You get to relax and calm your brain in order to unwind and properly meditate. This is a great plus as people find it more and more difficult to focus and shake everything else off. More than that, it can also help you get better sleep and become an overall more positive person. The biggest advantage that i can find with this product is that not everybody will be able to use it properly. Any muse meditation headband review makes it pretty clear that it is a product designed for the more technologically inclined customers. However, if you know somebody who can help you set it up or if you know that you are a fast learner you should definitely not hesitate and get the product. The bottom line is that the Muse headband is an absolutely amazing product. I recommend it to anyone who is keen on meditating and has trouble maintaining his or her focus. This will no doubt help you achieve your mindfulness goals and become a calmer, more relaxed person. Is the ‘Muse’ headband a form of bio-feedback? Can the headband be used on my ‘Mac Airbook’ as well? How expensive is the download? Does this device use binaural beats? The headband doesn’t use music, it measures your brain activity while meditating and gives you feedback in the sound of weather. So if your mind is active it sounds like a thunderstorm and if it is calm you will hear a calm breeze and birds chirping. It gives you statistics at the end which can be tracked over time. I am unsure that it works with a PC or not. Normally you connect it via bluetooth and your phone and use earbud style headphones. How much does the down-loaded software cost? It isn’t a download, it is a device. There is a free app that you can download and it connects to the device. Live in Brisbane Australia, how long is shipping? Does ‘Myndlift’ provide a better, more effective experience? How much is the ‘Myndlift’ programme? Can all purchase be made with ‘Western Union’? Does the latest version of ‘Muse’ have an extensive tutorial, which I believe is of great value.